I gave a speech in the House of Assembly last week that was received so warmly by my colleagues that I thought I would share a shortened version with all interested Bermudians though Bernews. Bermuda’s adverse economic conditions did not start in 2012 when the One Bermuda Alliance became the Government. The things that the Honourable members of the Opposition are reporting that they are hearing on the street are the same things we heard on the street in 2010, 2011, and 2012. People were stopping us and complaining in the same terms. So let’s not act like these challenges have just come to the fore. I accept that members of our community are struggling, but I take exception to Honourable members in this House who want to say that people on this side don’t care. People are frustrated, and yes, they will take their frustrations out on the Government of the day. Yes, we in the OBA saw certain things in the bye-election of Constituency #13. We know that we have work to do. It doesn’t take a rocket scientist to figure it out. What we inherited was a serious situation. There was a reason Honourable members on the other side lost the election in 2012. It happened because the country was headed in the wrong direction. That’s a fact. Our economy was, and still is, in debt… in terrible shape. I talked to some individuals the other day who are saying the exact same things that Honourable members on the other side are saying – they are frustrated and feel the OBA doesn’t care about them. I sat down with them and had a conversation. They said you want to take furlough days from the civil service and you want to take this and take that. Why are you hurting us? I took some time to explain it to them. I said let’s not talk about the debt. Let’s talk about the $170 million we pay in interest on the debt. By 2017, our interest on debt may be the highest expenditure of the government… more than any government Ministry. I asked if they realised that when the OBA government assumed power, Bermuda had a $330 million deficit. I talked about what they earned a month. Just for the sake of example, let’s say they earned $2,000 a month and their expenditure was $6,000 a month. That’s a monthly deficit of $4,000. 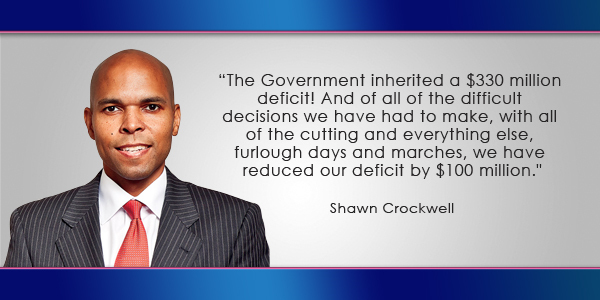 The Government inherited a $330 million deficit! And of all of the difficult decisions we have had to make, with all of the cutting and everything else, furlough days and marches, we have reduced our deficit by $100 million. That’s a lot of money. But we’ve still got $200 million to go. What that means is that there’s more pain to come. We’re not going to fix the problem without pain. When the PLP became the government, it was a healthy economy. They had years of boom and success. The question is what did they do with those boom years? How did they manage the record revenues they received? You can’t blame this government for putting us in this mess. You can blame this situation on the global economy, or whatever you want, but you can’t blame this government. Who’s to blame for that? Sometimes we persuade ourselves that the doctor was at fault. We shouldn’t, but we do. And so when we became the government I knew that because we had such a difficult problem to fix, and because the remedy was going to be so painful, people were going to be upset, and they were going to blame us. They were going to forget how Bermuda got in the mess we’re in and focus on who ordered up the painful medicine we need to swallow. The defeat we suffered in the bye-election told us that we are going to communicate better. We can’t stop the painful medicine, but perhaps we can explain our reality better to the electorate. I’ve heard people say that we need to take care of the poor. But we’re doing that! This Government has increased the Financial Assistance budget while we have been trying to cut budgets. We have increased our Financial Assistance budget by almost $20 million. We are spending $60 million or thereabouts on Financial Assistance. And if anyone around the table wants to suggest that we might have to look at cutting Financial Assistance, don’t bother. We just cannot do that, because we have to make sure that those people who are in that condition have support. So I’m not accepting the accusation that this Government doesn’t care. We are supporting individuals. But as the Honourable Attorney General said, when people complained that we haven’t increased pensions – how are we going to do that when we have nothing? We are broke! Bermuda, we are broke. We have an annual deficit, every year. We are spending $170 million in interest. We are not even touching the principal yet. So yes, we are in a difficult situation and we are all in it together. I was at a family function a couple of weekends ago and somebody said, well, you found $70 million for the America’s Cup. That’s the PLP’s message that’s getting out there. I said, well, yes, we have, but we’re not giving it away, it’s an investment. It’s an investment and we expect to get a substantial return for Bermuda. I guess we haven’t done a good job of explaining that. Recently, I got to see some evidence of how the America’s Cup is helping Bermudians. I went down to Morgan’s Point. I was given a tour of the Artemis facilities. I saw a contractor with his crew… a well-known PLP supporter. He said he’d been there for a couple of months. “This has been great,” he said. “I’ve had seven to ten staff here, young guys, all Bermudians. We’ve got about two or three more months to go. it’s a good project’. I asked the Artemis people how many of their staff were stationed at the site. The answer was between 55 and 60. They had 52 people actually resident in Bermuda, living throughout the West End. They anticipated that that between now and the America’s Cup, Artemis alone will spend about $2 million in rents. That’s one team. How can people say Bermudians are not benefitting from the America’s Cup? Add in the other resident teams and you will see how our investment is paying off. Very large sums of money are being paid to the Bermudians who are involved as contractors, as landlords, as people who provide transport and groceries and all the other goods and services that people need to live, and sailing teams need to get to the peak of their abilities. That money doesn’t just go into the bank accounts of Bermudians who work with the America’s Cup people and sit there, they themselves use it to pay other Bermudians for the supply of goods and services. It spreads very widely in our economy. There’s your evidence. Long before the America’s Cup event has begun, it is having a significant benefit to Bermuda and Bermudians. 29 Jan: Column: How Much Revenue Is Govt Losing? Thank you for this extremely important reminder. This guy really took the time of the day to blame the PLP for the OBA’s shortcomings. What a damn joke. I can’t stand stupid. Excellent, excellent article. I’ve long since realised that what is hurting the OBA more than anything is their terrible communication. Tell the people what you’re doing and why you’re doing it. Break it down into understandable chunks. The PLP are masters at spinning things, and people fall for it every time. I would go further on the Artemis numbers. Ok, $2M in rent alone. Great, but then add 52 people spending on groceries, gas, restaurants, cars, bikes etc etc, and you’re looking at the thick end of another $200k each month, or $2.4M a year. From one team. Those are the sort of figures that the OBA need to be putting out there. They cannot assume that the public understand, because the bye-election clearly showed that they don’t! This guy is a really bad politician. Because of him and other loud mouths is why they are not doing well. Government can’t fix the problem – get out of the way. Government creates environment for growth. Too many taxes too many civil servants. The Government IS fixing he problem that the pint, it takes time because the appalling mess was created over time! Get out of Government? So Bean and his completely unequipped shallow cabinet can “fix: the problem? Ridiculous! The truth is that numbers do not lie. After all of the tough decisions and rancor during the past 3 years the OBA government still has to reduce the deficit by a further $200 million!! No wonder the PLP is happy to be in the Opposition, no one would want this job. People may be mad at the government for the difficult decisions it has to make but history will celebrate this government for saving Bermuda from economic ruin. I just hope they can get their communications sorted out before it is too late!! IMO, the current Government is resigned to knowing they will likely not win the next election based on the knowledge that the policies they enact will not necessarily be popular as most of them are reactionary to things the average bermudian does not want to hear and frankly probably does not understand. So the PLP are in a position to prey on this and whip up a whirlwind of misinformation, slogans, tags and hate politics in order to emotionalize their voters to turn out at the Polls. But the fact remains that their party are the ones that systematically put us in this position by overinflating the civil service to highly unsustainable levels and embarking of a series of irresponsibly managed capital projects which most likely contain elements of corruption we have yet to come to light. Knowing this the OBA are enacting legislation that they feel is right for Bermuda’s long term survival, despite how unpopular they may seem it does not matter because they are getting voted out anyway! As long as the OBA remain the legal government they must push through policies that need to happen in order for us to have any chance going forward, regardless of those who oppose. The ones in opposition are the ones that are dragging us down the most economically in the first place, the PLP voting union members who are majority employed in the civil service. The ones that stand to lose the most for their parties poor governance. in other words…… the family is broke…… so we the oba have decided to give group A 77 million to play around in the water…. and group B we need to cut the amount of food you consume……..
And there you have it. One cunningly placed piece of complete misinformation designed to create a hate-filled environment. Divide and conquer. It begs the question Rhonda – do you want Bermuda to become prosperous again, or do you have another agenda? Way to miss the obvious point by trying to minimize people’s view of the whole picture… by the way, they have only spent $14m so far, with most of it going to Bermudians. You don’t get it and you never will . This is a good release. What the OBA needs is a team working full time on similar work. Why is this not clearly understood and effectively being done? Get on with it. Communicate. As a small business I have experienced in one year a direct impact from the America’s Cup opportunities. As one of the licensed vendors I directly supply Team Artemis and family and other teams with the Official America’s Cup Sunscreen. Not only has it opened a door to take control of my company financial future, the opportunity far exceeded Bermuda and has launched my small business that celebrates one year of business TODAY to conduct International Business on a GLOBAL platform. I can not say the OBA has lost my vote. Well said Minister Crockwell!! Good article. We need more stats from Government to show the complete influx of capital related to America’s cup. The projected savings that Govt is looking to make from the tough decisions they have to make and KEEP THE DEFICIT IN THE MINDS OF THE ELECTORATE !!! How quickly we forget. We want money for everything as if there’s a money tree out there somewhere. Reality is often a bitter pill to swallow but it must be taken with a clear and healthy dose of WHY these decisions have to be taken. There’s another great point about the OBA’s awful communication right there in the article. When they came to power at the end of 2012, they inherited a $330M deficit. To have reduced that figure by $100M, that’s 30%, in just 3 years is nothing short of astonishing. Why aren’t they shouting that from the rooftops?? Why did we have to find about about it buried in an opinion column? Great article and well written! I commend Mr.Crockwell and the OBA. It’s a bitter pill to swallow but eventually the right medecine does heal. Problem is, some people do not like is the cure if it’s painful and requires some sacrifice. I’m not a fan of crockwell but the company I work for has had an increase due to here for the America’s Cup. If these people weren’t here supporting our company we would be slow. AC is actually helping lots of businesses.